Enter the Sonic Labyrinth: a journey through surprising and interactive sonic experiences. ArtPlay’s New Ideas Lab supports artists and children to work together to develop new arts experiences. 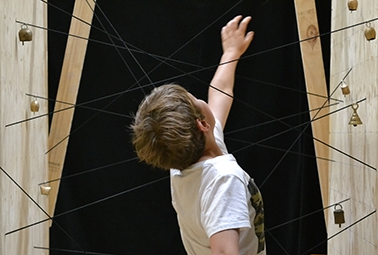 In the Labyrinth you can discover unusual ways to create and listen to sound using kinetic instruments, mysterious sounding objects, reverberant spaces, and special listening devices that enable you to hear sounds on the edge of perception. Shine lights, uncover clues, listen carefully, use your voice, and take the challenge to find your way through the Labyrinth! Your journey through the Labyrinth will have opportunities for solitary, intimate and collective sound-making, problem solving, creativity and deep listening in a space that is surreal and dream like.